Sometimes Chrome doesn’t handle flash very well ad you’ll get a variety of errors. Since Chrome comes bundled with it’s own version of Flash and you may have installed flash on your machine separately for Firefox or other browsers, it may get confused on which version of Flash to use. Kubuntu 12.04 annoyingly broke the details view in Dolphin. They show an expandable view in the pane rather than the folder contents. How to disable trees in Details view? When I first installed Kubuntu 12.04, my account was working just fine, but my wife’s account was acting very strange. It was very slow to react and most of the desktop would not respond. It turns out that my account worked because I had “Desktop Effects” turned on but I had the “Blur Effect” turned off in my account. I guess the “Blur Effect” has some issues with some graphics setups and mine was one of them. My wife’s account had desktop effects turned off and the upgrade turned it back on and “Blur Effect” evidently is one of the default effects. how do I stop automysqlbackup throwing LOCK TABLES error? For the longest time I searched to try to figure out why Ctrl+Alt+F1 would not bring me into a terminal, in fact there was no visible response at all to any of the function keys on my Logitech Wireless keyboard. Then I finally realized for the 50th time that Logitech screwed up by requiring you to have the function mode key activated, which is not default, for the keyboard to send the codes for the function keys. For some stupid reason their stupid second functions are the default not <F1>, F2>, etc. I have several infrared keyboards with integrated joysticks that I use for my MythTV boxes. Every time I reinstall the OS, I have to go through this rigmarole to get the joystick to control the mouse. 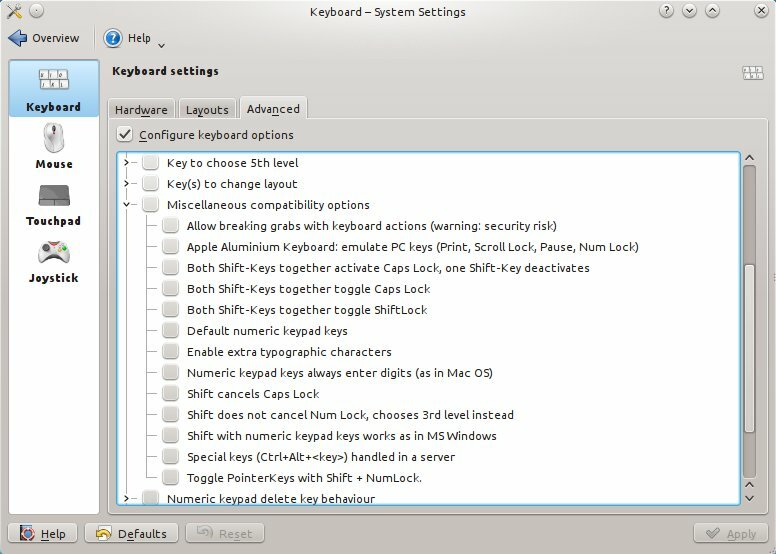 If that still doesn’t work, in Kubuntu 12.04, navigate to System Settings->Input Devices->Keyboard Setings->Advanced. Then open up the branch that says Miscellaneous compatibility options and make sure Special keys (Ctrl+Alt+<key>) handled in a server is unchecked.